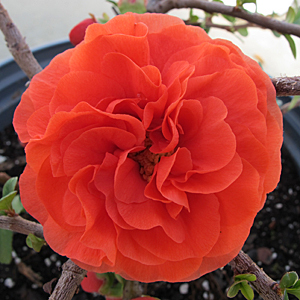 (Quince) Double Take™ Orange Storm, A double take is what you’ll do when you see this Quince that has flowers that look like a Camellia. 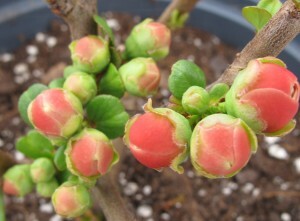 The Double Take series gives Quince a complete makeover starting with a spectacular display of big, double flowers in early spring. The flower color is a bold Orange. Look a while longer and you’ll also notice that Double Take is without thorns or fruit, and extremely drought tolerant. Double Take™ Orange Storm is excellent for hedging, mass planting and even flower arranging. A Proven Winners® ColorChoice® Flowering Shrub.